Dance parties, office parties, family gathering and outdoor functions, your social calendar must be filling up pretty fast this festive season! And of course, you cannot repeat the outfit nor the hair and makeup at any of these events. When you think of styling hair, you immediately think straightener and curling iron don’t you? We don’t blame you. A lot of your hair styling has to do with heat and heat styling. Heat styling and all the products can cause breakage and hair fall. So be extra careful and give your hair all the care and conditioning so you sail through the festive season without much hair loss. Pre-condition your hair with oil before washing it. Apply Indulekha Bhringa Hair Oil on your scalp a few hours before you wash it. This has the goodness of bhringraj, amla, svetakutaja and coconut oil that deeply nourishes and conditions your hair. Use lukewarm or room temperature water while washing your hair. Hot water strips the hair of its natural oils and makes it drier. Massage a mild shampoo like Dove Rejuvenated Volume Shampoo on to your scalp in gentle, circular motions. This shampoo is formulated help replenish nutrients the hair loses constantly. Apply a conditioner like Tresemmé Hair Fall Defense Conditioner only from mid-lengths to the tips, not near the scalp. As soon as you step out of the shower, wrap your wet hair in a micro fibre towel or a soft old cotton t-shirt. These are good for absorbing the water and gentle enough on your hair. Avoid rubbing your hair to dry it. Don’t blow-dry your hair when it is wet, air dry it and after it is 80-90% dry, apply a heat protection spray like Toni&Guy Sibling London Limited Edition Heat Protection Mist and then use a blow drier to completely dry your hair. In the shower, detangle your hair with a wide tooth comb while there is conditioner in your hair. It helps spread the product and makes drying easier. Metal barrel brushes and round brushes are meant to be used while styling your hair. Use a brush with natural bristles like boar or cactus bristles that help spread the natural oils evenly through your hair. Detangle your hair from the tips. 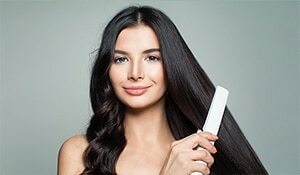 When you try brushing your hair from the roots, you are tugging the hair roots and simply pushing the tangles away from the roots towards your ends. So start detangling a few inches from the tips and go on detangling as your move towards the roots. Finish your look with the Toni&Guy Glamour Finishing Shine Spray for a smooth and shiny finish.